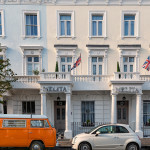 Situated on a peaceful residential street in Pimlico, one of London’s prettiest and most central areas, The Melita is perfectly located to enjoy the best that London, one of the world’s most exhilarating cities, has to offer. 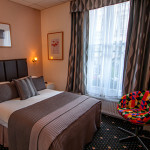 Only a hop, skip and a jump from Buckingham Palace, Big Ben and the Houses of Parliament, the hotel is perfectly placed for work or pleasure. Victoria has many exits, so make sure you make your way towards the Wilton Road exit. Start walking down Wilton Road and 50 meters further down on your left you will see Argos. Keep walking along that road for approximately 7 minutes (follow the 24 bus if you see one). You will pass a Sainsbury’s supermarket on your right hand side. When you reach the traffic lights, keep walking straight until you reach Belgrave Road. Turn left onto Belgrave Road. You will see the Italian Restaurant O’Sole Mio on your left hand side. Keep going for 30 meters and then take the first right onto Charlwood Street, where you will see The Melita. 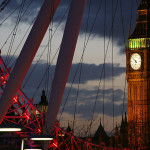 The Stansted Express Train will take you to the Liverpool Street Station (fares from £19 if booked online in advance). You can then take the London Underground to Victoria or a taxi from there. Some trains stop at Tottenham Hale. If they do you can get off there and get the Victoria line on the London Underground to Victoria. This saves time. Alternatively, take a bus from the airport straight to Victoria (fares from £7). If you arrive late at night take a bus every time, unless you get a taxi (which costs from £80). You can take a bus which will take you straight to Victoria (fares from £8), or you can take a train to St. Pancras International (fares from £19). From there take the London Underground to Victoria Station. Taxis cost from £80. You can take the London Underground to Victoria Station (fares from £5.70 with an Oyster card). You can take a bus directly to Victoria (fares from £6). You can also take the Heathrow Express to London Paddington (fare from £16) and then get the London Underground to Victoria. Taxis costs from £45. The Gatwick Express train will take you straight to Victoria Station (fares from around £12 if booked online in advance). A taxi then to the hotel costs around £6. 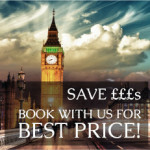 Taxis from Gatwick airport direct to the hotel cost from £60. Even though it is a 9 minute walk, we advise you to take a taxi the first time, especially if you have luggage or it is raining. The costs is around £5. A taxi costs £18-£22. Alternatively take the Victoria Line underground to Victoria / Pimlico (fares from £2.10 with an Oyster card). We are outside the Congestion zone. There is free on street parking from 18:30 – 08.30 Monday – Thursday, and 18:30 Friday – 08.30 Monday (do not park on double yellow lines though! ).